1. Cook the broad beans in boiling salted water for 3 minutes, then drain and refresh under cold running water. Remove from their skins and set aside. 2. Cook the peas in boiling salted water for 2 minutes, then drain and add to the broad beans. Mash very roughly with a fork. Pour in the olive oil, squeeze over the lemon juice and season with a little salt. Cool the mixture to room temperature. 3. Stir in the lemon zest, pecorino, mint and chilli. Taste and adjust the seasoning, if necessary. 4. Grill or toast the bread until golden on both sides, then rub one side of each slice gently with the cut garlic to flavour it. 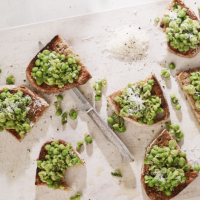 Drizzle over the remaining 1 tbsp olive oil and top with the broad beans and peas, grating over a little extra pecorino if liked. This recipe was first published in Thu Apr 26 16:31:15 BST 2018.